Jeep Wranglers Are Fun To Drive… But Are They A Smart Buy? Should you buy a Jeep Wrangler? Well, it’s definitely not the best vehicle for everyone. It pretty much depends on your personality — and your sense of adventure — as to whether you would be comfortable owning one or not. Some think a Wrangler is just a crude form of SUV. But the Jeep Wrangler is more about attitude and less about practicality than most other SUVs on the market these days. In effect, Jeep put “utility” in the sport-utility vehicle and they called it a Wrangler. With removable doors & windows, a fold-down windshield, removable top, replacement half-doors, holes in the floorboards for hosing out the interior when it’s dirty… now that’s utility! You will long for days when you can take the top and doors off and feel the wind through your hair . You will crave the attention you receive from other drivers – those in Jeeps, and those just envying yours. You will keep your eye out for yet another add-on that will make your Jeep uniquely yours. You will be inclined to become a do-it-yourself mechanic, as repairs are quite simple. You will enjoy driving during all weather conditions and in all four seasons. You will have a new fraternity of friends – those you’ll meet around town who own a Wrangler, and those you’ll meet at Jeep events across the U.S., in Jeep message boards, chat rooms, etc. In sum, I’d say a Jeep Wrangler gives you the ability to express yourself, and allows you the freedom to drive anywhere you want to drive. It’s the ultimate “go anywhere, do anything” vehicle! While a Jeep Wrangler does ride more like a truck than a car in many ways, it’s the type of vehicle for those who want to feel in touch with the road beneath them. Buying a Jeep also admits you into an extremely active and public fraternity. Whether you’re young in age or young at heart, it’s the youthful sense of adventure that make a Wrangler a great vehicle to own. And to top it all off, Wranglers hold their value quite well, so you’ll get excellent resell value when you’re ready to sell. If you don’t like the outdoors, you won’t like a Wrangler. If you’re overly concerned about luxury, safety or security, you won’t like a Wrangler. If you really need a passenger vehicle, a Wrangler probably won’t work for you. If you need space for hauling things (luggage, groceries, etc. ), the Wrangler won’t do it for you, nor does it have a trunk compartment that locks. If you have a long commute, you won’t enjoy the noisy ride, and the Wrangler guzzles gas. If you have a large family, you won’t be able to comfortably seat everyone in a Wrangler. If you (or your passengers) are concerned about how you’ll “look” when you get to your destination, then you might not appreciate the “sweat factor” or “windblown hair” you get from riding in a Jeep convertible. It’s true. The Jeep Wrangler is definitely a “no frills” vehicle. It comes with very few “extras”, and some of the most basic things (carpet, steel doors, rear seat) are considered options. And it’s not a comfortable “city car'” by any means. In fact, it’s a better choice as a 2nd or 3rd car than as a primary vehicle. And it’s far more practical for single people than for families with children. So, if comfort, security, and safety are tops on your list of vehicle requirements, you should probably think twice before buying a Jeep Wrangler. 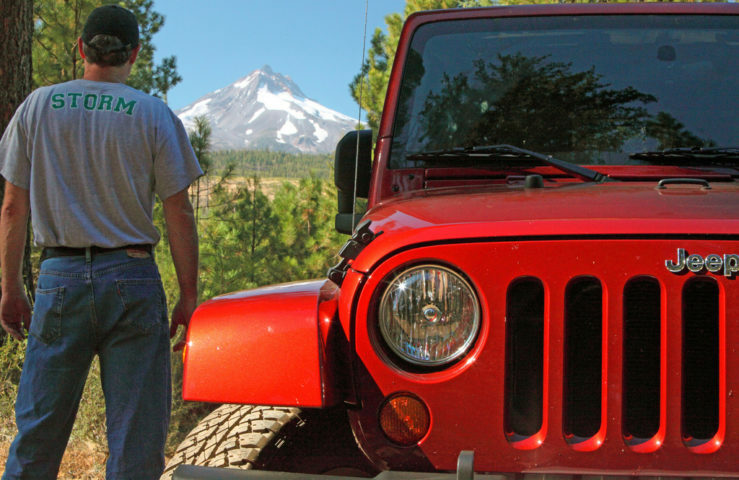 –> Check out the pro’s and con’s of owning a Jeep Wrangler.